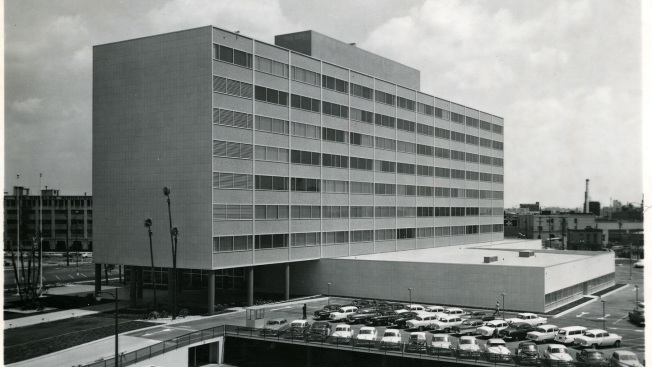 Although the City Council voted over a year ago to tear down Parker Center, the former Los Angeles Police Department headquarters, AIDS Healthcare Foundation President Michael Weinstein and his supporters announced an effort Thursday to halt the wrecking ball and convert the building into a homeless shelter. "Every time City Hall wants to give an exemption to a luxury developer, they scream NIMBY," Weinstein said. "Well this is in their backyard, so they can show leadership by doing something in their backyard." In response to the rise in homelessness the last few years, Mayor Eric Garcetti and other city leaders supported Measure HHH, a successful 2016 ballot initiative that aims to raise $1.2 billion for permanent supportive housing for the homeless. More recently Garcetti and the City Council have also put focus on temporary homeless shelters in the form of large tents and trailers and approved a $20 million plan to install them in each of the city's 15 districts. "Let's get real. We are not going to solve the problem of homelessness if we spend $450,000 per unit. That not just doesn't make sense," Weinstein said. "It's plum crazy, and it takes a long time. The reality is that the only solution is adaptive reuse." A spokeswoman for Garcetti said the mayor had no comment, and City Councilman Jose Huizar did immediately respond to a request to comment. Huizar's district includes the Civic Center, and he led the proposal to demolish Parker Center. Huizar's district also includes Skid Row, where an estimated 2,000 homeless people are located, and the councilman has said he hopes to spend at least $20 million on temporary shelters there. According to the city, Parker Center has asbestos contamination, but Weinstein said he met with Garcetti and offered to pay for the asbestos cleanup. He also estimates the building, which is located across the street from City Hall East and two blocks from City Hall, could house 732 beds for homeless people at half the cost of the city's $483 million plan for a new office tower needed for government employees. The Coalition to Preserve LA was the driving force behind Measure S, a failed 2017 ballot initiative which would have imposed new restrictions on the construction of housing, shops and offices in Los Angeles. The group argued that rapid development in L.A. is driving up housing costs and making some of the foundation's patients homeless. "They need to stop and think what they are doing. To tear down a building that would house 732 homeless people for a 10-year-old plan for a luxury office tower for city workers is not humanitarian, it's not smart, and it's really outrageous," said Jill Stewart, executive director of the Coalition to Preserve LA. Weinstein was asked by reporters why he is bringing forward the shelter initiative more than a year after the city finalized the building's demolition, and why his organizations did not take part in the public meetings last year. "I don't think the burden is on nonprofits to tell the city how to do its job," he said, and added that "there's 1,000 things and we can't be involved in them all." When reminded that the demolition of Parker Center was only part of city's plan for the Civic Center redesign, Weinstein asked, "Why should people care about that?" The debate over Parker Center's fate in 2017 was an emotionally charged one, even bringing Huizar to tears at one point. Much of the emotion was due to the building's connection to the LAPD's checkered past, as well as the fact that it used to be located on a key block in the Little Tokyo neighborhood which was seized by the city through eminent domain in the 1950s. Allegations of corruption and institutional racism, along with abuse and discrimination against the black community, are part of Parker's legacy.